Synopsis: Sadie hasn’t had an easy life. Growing up on her own, she’s been raising her sister Mattie in an isolated small town, trying her best to provide a normal life and keep their heads above water. Sadie is such a unique book. Told in alternating narratives from West McCray, the podcaster looking into Sadie’s disappearance, and Sadie her self from the moment she left, until the two stories meet up in the present. 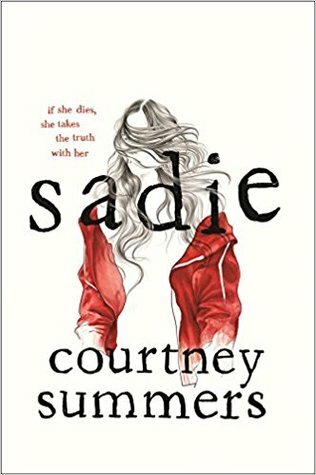 Sadie’s younger sister Mattie was found murdered and because of their home life, Sadie feels like she is responsible for finding Mattie’s killer. So she sets out on her own, without telling anyone where she is going, on a mission to hunt him down. West McCray is a podcaster who hears about Sadie is passing while he’s working on another project. But something about the girl and her disappearance nags at him and he decides to look into her life and help her loved ones bring her home. The entire time I was reading West McCray’s podcast “voice over”, I heard David Rigden’s voice. David Rigden is the voice and creator of the podcast Someone Knows Something. Everything about the was West McCray tells Sadie’s story made me think of Rigden’s podcast and the way he masterfully tells the stories of real people and what they’ve lost. Telling the story in alternate narratives this way really keeps the reader engaged and flipping pages wonder what happened to Sadie and if she accomplishes her mission of finding her sister’s killer. I read Sadie in just a few sittings and definitely recommend it to anyone who likes mysteries! Thank you to Wednesday Books for sending me a copy of Sadie in exchange for my honest opinion! I really enjoyed it! I just thought the way the story was told was so unique!